National Rail Enquiries (NRE) is the definitive source of information for all passenger services on the national rail network in England, Scotland and Wales. It handles around 2.9 million journey enquiries every day, across nationalrail.co.uk, apps, SMS and its 08457 48 49 50 live operator contact centre. It is in fact eth busiest phone number in the UK. To handle this vast level of interactions, NRE is using Content Guru, as well as to deliver TrainTracker Text, an automated service that uses keyword recognition technology to give customers access to live journey info via SMS. The TrainTracker Text service uses custom integration to enable Content Guru’s cloud-based storm communications platform, which processes the inbound and outbound texts, to leverage information from NRE’s systems that provide real-time travel information and calculate the optimum route between stations. 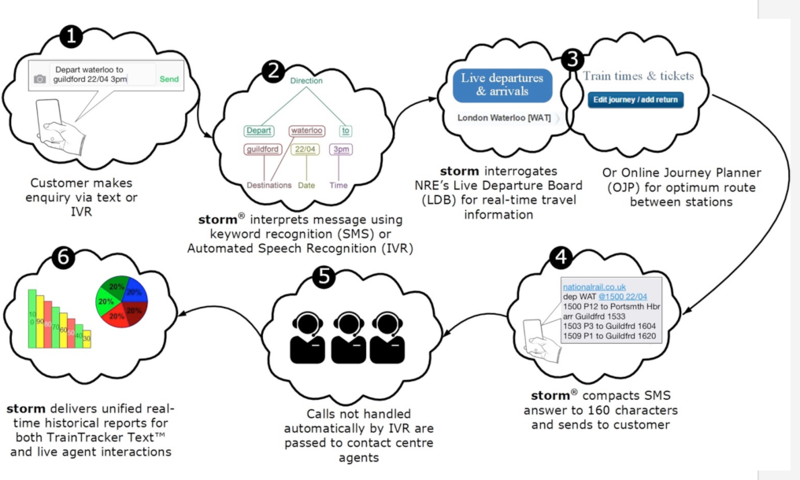 If the customer request involves just one railway station, storm passes it, together with authentication details, to the NRE Live Departure Board. If the request involves more than one station it is passed to the NRE Online Journey Planner. In each case, the NRE system authenticates the request before enabling storm to access the appropriate resource. The request is passed by storm via a simple internet request using the Simple Object Access Protocol (SOAP). Thanks to the TrainTracker Text service and storm IVR, rail passengers can access journey information quickly and reliably – without having to wait for a live operator. The SMS service alone currently handles thousands of enquiries every day with an accuracy rate of 95%+. EDITORIAL Health, wealth and happiness? The TELEMEDIA INDUSTRY represents a commercial value chain of suppliers that develop technical, network or payment services in order to enable premium content, service and applications / apps that drive billable network traffic, minutes and messages e.g. premium SMS PSMS and even some instant messaging (IM) applications. What can Telemedia do for you?